Description A funny casual game with lots of achievements to unlock. Jump, dive and zap brides on your quest to freedom. In this comical game your goal is to not get tied down to commitment and run as far as you possibly can. 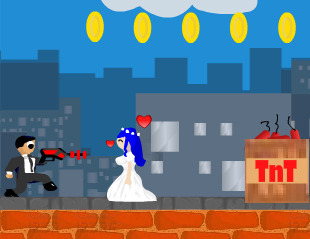 Jump over dynamite and shoot the brides with your laser by pressing CTRL and see how long you can remain a bachelor. Controls Space to jump (2x for double jump), CTRL to shoot.